Display the message inbox screen. E-mails: Select “Mark Unread” or “Mark Read” to mark mail unread or read on the message inbox screen. Messages are displayed in the appropriate connected Bluetooth® phone’s registered mail address folder. Only received messages on the connected Bluetooth® phone can be displayed. The text of the message is not displayed while driving. When “Automatic Message Readout” is set to on, messages will be automatically read out. Turn the “PWR•VOL” knob, or use the volume switch on the steering wheel to adjust the message read out volume. 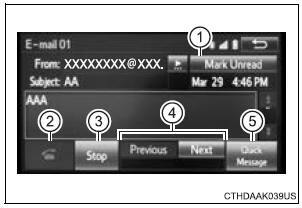 The message read out function is available even while driving.